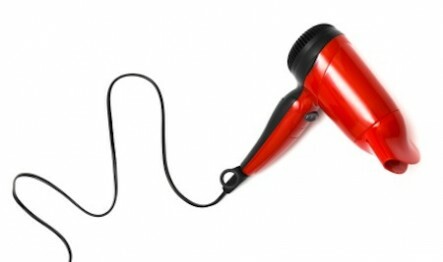 Read on to check out how useful a hair dryer can be! 1. If you need to quickly set the icing on a cake, the air and heat of a hair dryer can quicken up the process. 2. If your cake won’t unstick from the cake pan, use your hair dryer on the bottom of the pan then invert it, it should drop right out. 3. Running an ice cream scoop under hot water helps, but you can also try using a hair dryer on the carton to soften ice cream for easy scooping. 5. Automatic ice-makers can get jammed with frozen ice, relieve that with a long blast of hot air to melt unwanted icebergs. 6. Remove contact paper from shelves by heating it with the hair dryer and gently working the edges up. Also works for bumper stickers and other rogue sticky things. 7. Use a hair dryer to dust hard-to-dust items; the air will blow the dust somewhere else, but hopefully somewhere else that is easier to dust. 8. Personally, I like my kids’ crayon marks on my walls, but for the rest of you: heat the crayon marks until softened, then scrub with hot water and detergent. 9. Old photo albums with magnetic pages can get stuck–unstick them with a blast from the hair dryer. 10. Spot iron wrinkles by lightly dampening the area and then heating the wrinkles with your dryer. 11. Wet boots, shoes, and sneakers can take on a terrible odor if left to dry slowly–alleviate that by drying them with your hair dryer. 12. Winter can bring frozen windows and locks–thaw them with a hair dryer. 13. Window screens collecting dust and pollen? Blow it back to whence it came. 14. Removing bandages can hurt more than the wound, soften the adhesive with a hair dryer first to ease the rip. 15. If you have trouble keeping a hot compress hot, keep your hair dryer by you and reheat as necessary.